Keep your equipment in top condition, these points should help! After a day of fishing or cruising, you must clean your boat to maintain the appearance and resale value. Clean the exterior then the interior. The following is a guide for caring for your boat/yacht using the proper procedures and the best in marine maintenance chemicals. The first step in cleaning a boat is a good rinse. Flood the entire exterior with water and include the antennas, outriggers, bow rails, bridge curtains, etc. Salt needs only a few days to pit a metal surface and discolor fiberglass and wood. Wash the boat with a solution of 1 ounce OrPine Boat Soap or 1 ounce OrPine Wash & Wax in 3 gallons of water. Most soaps contain large amounts of water. OrPine Boat Soap and OrPine Wash & Wax are very concentrated products. These products are superior for removing salt and leave no residue after rinsing. This eliminates streaking and spotting. Rinse the boat well and chamois dry for a spotless clean appearance. OrBrite will remove small scratches and any film that may be present to "clear-up" your view. Apply OrBrite with a soft rag, then towel dry and buff to shine the plastic. OrBrite also works for cleaning mirrors, Formica, and plastics. Treat zippers and snaps on the bridge curtains with Corrosion Block to lubricate the zippers and eliminate corrosion that can cause poor operation of both metal and plastic parts. Wax is probably the best protection you can provide to shield your boat from the salt, sun, rain, snow, dirt, and environmental pollutants. Use a good metal wax/cleaner to clean all metal on the boat including the bow rails, cleats, outriggers, fishing chair, ect. Treat rust and corrosion with Corrosion Block. The key to a good wax job is to apply two coats of a good paste wax, evenly, to the entire boat using a soft cloth. Include fiberglass, wood, and metals. Allow 3-4 hours setup time. Buff to a shine, then follow with another coat of paste wax and buff to a shine. This will give exceptional protection that will last for 3-4 months for exposed surfaces, longer for unexposed areas. 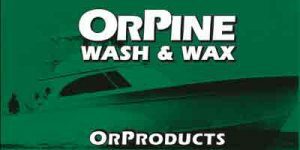 washing your boat with OrPine Wash & Wax will leave a thin coat of wax on your boat that will extend the life of the paste wax. Proper engine room maintenance on a routine basis will extend the life of the major running gear of your boat. Observations made during engine room maintenance can eliminate costly breakdowns by spotting oil and fuel leaks, worn belts, faulty wiring, etc. Take a wet/dry vac and several disposable paint brushes into the engine room. First remove all particles of debris (e. g., wood chips, wire ties, nuts & bolts, etc.). Clean the exterior of your engines and generator. This will allow you to spot oil leaks and general problems that may be overlooked. Use OrBilge, 2 oz. per 3 gallons of water for cleaning. If the engines are extremely dirty, use "Gunk" to clean following directions on the container. Treat the engines and all electrical connections with Corrosion Block to prevent rust and corrosion. Clean chrome or stainless parts on the engines with metal wax/cleaner and treat with Corrosion Block. Before cleaning the bilge, turn off the bilge pumps to avoid pumping dirty bilge solution overboard. Also turn off the electrical supply to the bilge for safety. Mix 2 ounces of OrBilge in 3 gallons of water and wash the bilge area thoroughly with the solution. Wait a few minutes, then rinse. This will give the OrBilge a chance to cut the dirt, oil, and fuel. A toilet brush comes in handy for those hard to reach areas. Rinse well using hot water, if possible. A second application of OrBilge solution may be required for extremely dirty areas. Vacuum up the dirty bilge water and dispose of properly using local regulations. Add OrBilge to the water left in the bilge areas throughout the entire boat. Agitate the solution and allow it to stay in the bilge for 15 - 20 minutes. Turn on the bilge pumps and pump out the OrBilge solution. This will clean oil and fuel from the pumps. IMPORTANT! Add salt water to the bilge. The salinity will eliminate the stagnate water, oil, and fuel in the bilge from producing the sulfur scum and odors. Proper cleaning and maintenance of your bilge with OrBilge will improve the overall odor of your boat. Cleaning products are potentially one of the biggest causes of teak deterioration. Teak is composed of hard and soft grains of wood with the soft grain being a sugar base material. Any protein based detergent or two part cleaner, used with a brush, will loosen the soft grain. After rinsing, a ridged effect will be left instead of a smooth surface. Do not use harsh two part cleaners!! Use a brush heavily as a last resort for this will necessitate dry sanding. Use a solution of sudsy ammonia and water for dirty teak, 1 quart in 1 gallon hot water. Use a green 3M scrubber to get into all the corners. Be careful not to scratch any gel coat or paint near the teak. To strip oil from your teak, you may have to sand the surface. Wet sanding is the preferred method. When the teak cleaning is completed, rinse well. You should be aware that the ammonia solution will remove the wax from gel coat or wood. These areas should be waxed as soon as possible. In the interior of the boat, wash the floors, heads (including shower stall),and the galley. Wipe down the interior walls several times a year. You will be pleasantly surprised when you return for the next trip. the interior will have a pleasant odor instead of the musty mildew odor we all have encountered from time to time. Treat the entire electrical system and the electronic connections with Corrosion Block to kill corrosion, the green and grey stuff, and prevent future problems. Use Corrosion Block in fuse panels, marina electrical posts, electric motors, electric switches and relays, auto electrical systems, and anywhere moisture creates problems. Corrosion Block does not contain wax, tar, asphalt,or silicone. Rinse tackle well with water and wash with OrPine Boat Soap. Rinse, dry, and treat with Corrosion Block. Corrosion Block will not harm nylon or polyester line. Wipe guns until dry, clean, and treat with Corrosion Block. Use Corrosion Block in the barrel and internal areas to treat and prevent corrosion and rust. Wipe the outside with Corrosion Block to prevent fingerprint rust spots.